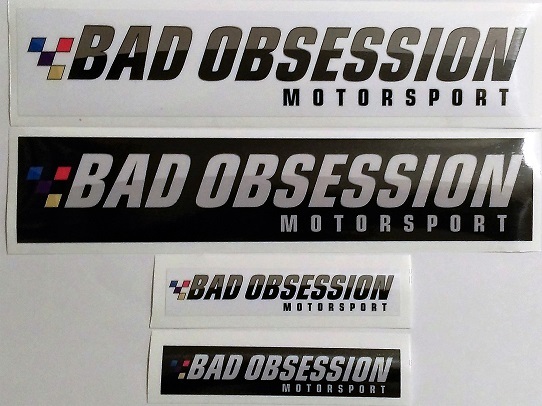 By popular demand, we bring you this four piece Bad Obsession Motorsport sticker set. You get two stickers measuring 220mmx45mm and two stickers measuring 100mm x 20mm. One of each in the black and white designs in each size. This criminally poor photo doesn’t do them justice, they really are super, extra lovely and would make any toolbox, car bumper, phone case, bicycle, cockatiel, monitor, fridge or mirror instantly at least 30% better. 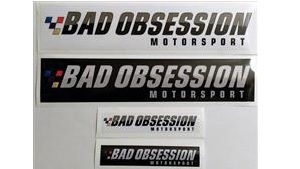 The high quality LG Hausys media is printed on by printing professionals using stuff we can’t even begin to understand, suffice to say, they look ace to us so buy a pack now and get stickering to your heart’s content!